Looking for guest house or B&B accommodation in Devon? 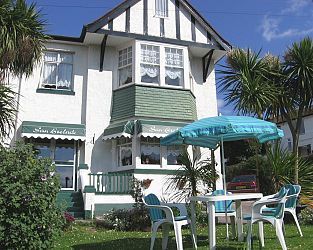 You'll find a warm welcome at the San Brelade Guest House in Paignton, run by Rob and Lindy Ower. Visit Paignton Devon and the surrounding villages and stay in bed and breakfast, hotel or self catering cottage accommodation provided by BedPosts members. Paignton is a bustling Devon seaside town, with miles of caravan sites, holiday camps, hotels and guest houses. Paignton forms part of Tor Bay, a popular holiday destination, together with Torquay and Brixham. Now populated by about 50,000 people, was founded in Celtic times. Even in the 19th century Paignton was a small fishing village until the construction of a new harbour led to its expansion. The Paignton has a zoo and pier. The beaches are of shingle, gravel and sand. There are good views from Roundham Head, where there is a public garden. If you seek accommodation near Paignton in Devon you have come to the website of a “club” of providers who offer affordable quality accommodation around UK in hotels, bed and breakfasts, guesthouses, inns, and restaurants plus self-catering cottages and apartments .